A year has passed since the beginning of the pro-democracy uprising in Bahrain. On the eve of this anniversary, the Islamic Human Rights Commission (IHRC) decries the silence of the international community on the abuses that continue to be perpetrated against the people of Bahrain. 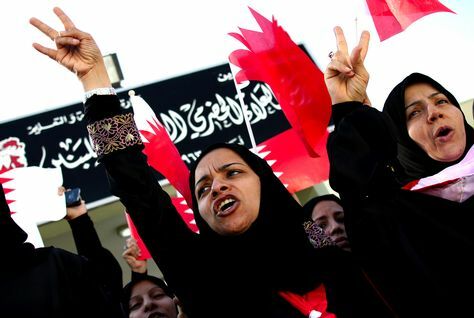 It is significant to recall that Bahrain’s pro-democracy uprising was the only one in the Arab Spring to be crushed by invading foreign armies; those of Saudi Arabia and the United Arab Emirates. The suffering of the Bahraini people was severe. The systematic targeting and abuse of peaceful protestors, human rights defenders and, most outrageously, medical staff are well documented. Yet the international community remained silent on the grounds that we should wait for the findings of the Bahrain Independent Commission of Inquiry. The report has since been published, confirming the horrible abuses, yet the killing and abuses continue unhindered today. We have seen no response from the international community besides legitimisation of its relationship with Bahrain’s regime. Revolutions may be spreading across the Middle East, but in the Gulf, it is merely business as usual. This silence must end now if all our pro-democracy rhetoric is to ring true. The people of Bahrain are just as worthy of self-determination and self-governance as all other people in the world. It is time to end hypocrisy, double standards and appeasement so that Bahrain’s revolution is recognised in line with the others in the Arab Spring.